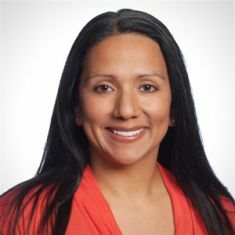 Monica Trevino, a senior consultant at Health Management Associates' flagship location in Lansing, recalls the story of a woman who waited several hours for her Medicaid-contracted transportation service to pick her up from her child's doctor's appointment. The woman called the driver and the transportation provider's number but couldn't get in touch with anyone. A security guard waited with the woman and her child as the office closed. The driver did show up eventually, but even then, the vehicle itself wasn't in good shape. "Additionally, she had left her other children with a friend, and by the time she got back to pick up her kids from the friend's house, the friend was terribly upset that it was so late," Trevino says. The woman lost that friendship over the issue. "That means a vital part of her personal safety net was no longer there because of the long wait she had no control over and had been trying to remedy," Trevino says. Trevino heard that woman's story while conducting focus groups with health professionals and Medicaid patients about non-emergency transportation to healthcare appointments. Sadly, similar tales are common. Lack of access to good transportation options continues to be a barrier to health equity for many Michigan residents. Various programs around the state are trying to address this social determinant of health. Although their efforts are uncoordinated, these programs address the issue either by transporting people to healthcare or by bringing services and goods to those who lack transportation. Vendella Collins is the executive director of the Michigan Developmental Disabilities Council (DD Council), an advocacy organization of the Michigan Department of Health and Human Services (DHHS) for people with developmental disabilities. She says "the system is broken" when it comes to coordinating transportation benefits for qualifying Michigan residents. Collins says patients are often told to ask a relative for a ride first, and if a relative can't be found, they often "go around in circles" trying to find a transportation provider. Sometimes they'll call a health provider's office, only to be told to call the DD Council, but the council specializes in advocacy work and doesn't provide transportation services. The DD Council will then tell them to call the provider again, but the patient may go in circles again on the automated phone system, trying to find the right person to speak to. Each DHHS location is supposed to have a designated transportation director, but "when you call the system, in its menu of options, it lists everything except transportation," Collins says. Rayman Mohamed, associate professor of urban studies and planning and chair of the College of Liberal Arts and Sciences at Wayne State University, says transportation is a health equity barrier, but the way cities are built is the real core of the problem. He says "transportation plays a role, but not a first-order role, maybe second- or third-order" in the health equity equation. "The more important attribute of a built environment is higher density," he notes. "That means people can get by without a car, because they can conveniently walk to various things. With higher density, (public) transportation becomes more feasible." 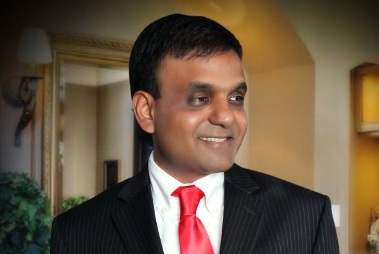 Rayman Mohamed.Making access to public transportation easier for patients is the focus of an app called BusMe, which Mohamed helped develop with funding from the Michigan Health Endowment Fund. "The app is supposed to give text directions for people to be able to use the DDOT bus system to get to health care appointments," Mohamed says, with a focus on pediatric patients and their parents. The app goes through a provider's patient databases the night before a user's medical appointment and sends out a message with navigation instructions for Detroit's bus system. The app is purposely text-based to address another disparity: the gap between those with smartphone access and those without, since "a large segment of the population doesn't have smartphones." Mohamed says the app is finished, but he and his colleagues are currently evaluating it and will be making updates and adjustments as necessary. Trevino says different approaches to overcoming transportation barriers are needed for different environments. In Northern Michigan, it's hard to live without a car, so most Medicaid patients there ask for mileage reimbursement. In urban areas, patients can receive bus tokens for public transportation, or can take advantage of livery-type services that come right to their door. "Each of those approaches has its own set of issues," Trevino says. In Grand Rapids, focus group members told her that the GoBus paratransit service doesn't include some of the medical complexes on the outskirts of town, so accessing those specialist offices becomes difficult. Parents in rural areas in Northern Michigan often have to travel many miles to take children to a specialty clinic in Ann Arbor or Detroit, and while they can be reimbursed for their mileage, the paperwork can be "burdensome," Trevino says. "After surgery, getting a signature on the form is the least important thing on their mind because they're so worried about their child," Trevino says. Trevino says Medicaid officials are already using their "regulatory leverage" to tighten up service by transportation contractors while trying to streamline some of the paperwork for patients. But she adds that she'd like to "formalize" more partnerships with existing "community-based gap-filling programs." Those programs may be run by hospitals and health clinics or community organizations concerned about health transportation issues, and Trevino says their existing personal connections to their communities are important. "The closer the service is to the people that they're serving, the more high-quality it tends to be," she says. Some health transportation initiatives focus not on giving rides, but on bringing health to patients. That's the case with Lenawee County's Veggie Mobile, a project of the Ohio mission-based not-for-profit healthcare organization ProMedica. Sara Gould with the Veggie Mobile. 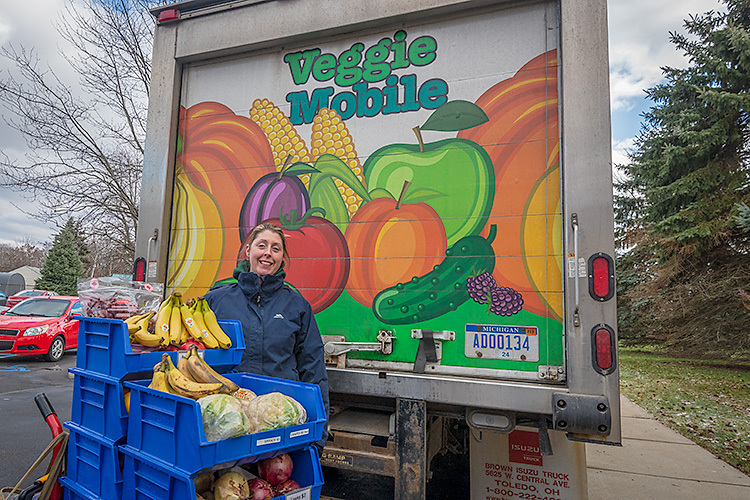 Stacey Tilton, coordinator for ProMedica Farms and the Veggie Mobile, says that despite being an agricultural community, Lenawee County is considered a food desert. The county's average household income is around $27,000 for a family of four and 37 percent of its population are seniors. These combined factors inspired ProMedica to launch a mobile food program. Tilton orders produce from local growers and fills in the gaps with produce purchased from wholesalers. 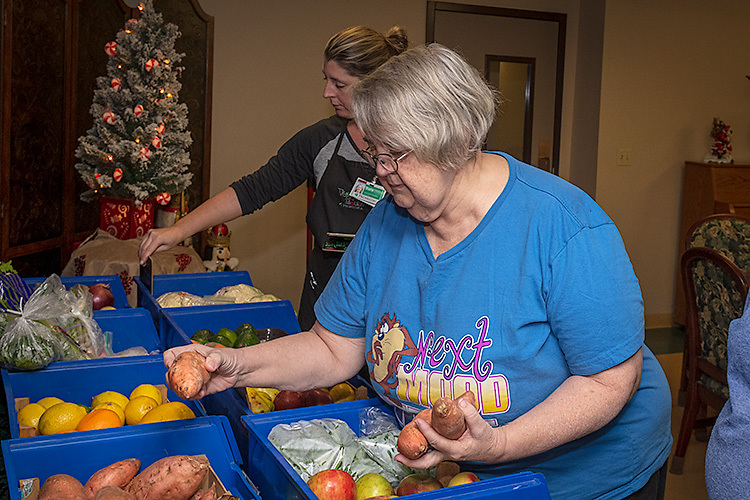 The Veggie Mobile runs Monday through Friday, making five or six hour-long stops each day at locations ranging from the local Secretary of State office to a senior center to an apartment complex that largely houses low-income residents. Orchard Terrace residents browse Veggie Mobile produce. Patients at the county health department are screened for food insecurity and are referred to the Veggie Mobile where they can use many different types of payment, including EBT/SNAP, Senior Fresh coupons, WIC, and Double Up Food Bucks. 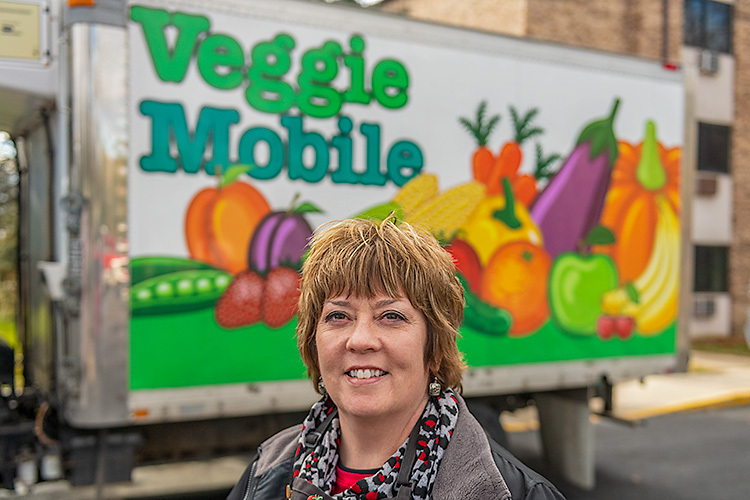 ProMedica sells the produce for wholesale prices, so if ProMedica pays a dollar for the produce, so do Veggie Mobile customers. Many regular users have expressed great appreciation for the Veggie Mobile. However, Tilton says many county residents are hesitant to admit that they're in need, so it can be a challenge to "empower the individual without making them feel bad or guilty." Stacey Tilton with the Veggie Mobile. Collins notes that transportation difficulties tie into almost every other social determinant of health. "It impacts all life areas if you can't get to where you need to be. You can lose jobs, family, friends, and housing. Worst of all, it impacts your confidence when you lose the ability to really live a self-determined life," Collins says. But when transportation barriers are broken down, she says, "it helps you be connected with other parts of your community and reduces isolation." Sarah Rigg is a freelance writer and editor in Ypsilanti Township and project manager of On the Ground Ypsilanti. She has served as innovation and jobs/development news writer for Concentrate since early 2017 and is an occasional contributor to Driven. You may reach her at sarahrigg1@gmail.com. Monica Trevino photo courtesy of Health Management Associates. Rayman Mohamed photo courtesy of Wayne State University. All other photos by Doug Coombe.